A quality painting of Brighton Pavilion by Isherwood has been sold in auction for £4,000. The work of art went through Hall’s Auction Rooms in Shropshire on 24th March 2010 – and was considered to be in the top range of Isherwood’s work. As collectors appreciate, Isherwood’s work varies in quality – and his best works are hypnotic and now bring high sums. Isherwood himself is known to have burned piles of his oils in the back garden of his Wigan Lane home and more – some superb – were lost in the disastrous fire at his home in 1983. 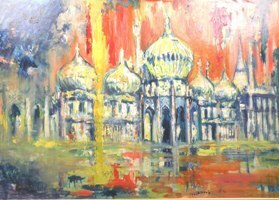 The large “Rain – Sun – Brighton Pavilion” was consigned to the auction by a private owner and expert Bill Lacy’s hammer went down at the £4,000 reserve price. “An exceptional painting” he said.